The Driver is responsible for transporting souls from the Grey Town to the Valley of the Shadow of Life. He hides his face, and seems to be “full of light,” suggesting his supernatural, even angelic, qualities. One of the souls who waits in line for the bus to the Valley of the Shadow of Life—he gets in a fight with the Big Man and leaves before the bus arrives. A large, aggressive man (and later a ghost) who argues, gets in fights, and ultimately refuses to believe that he can go to Heaven by exercising humility. A young, pretentious man who’s gone to the Grey Town after committing suicide. He thinks that he’s better than everyone around him, and loves to complain about people and places. A Spirit who knew the Big Man while they were both alive. In life, Len murdered Jack, but—much to the Big Man’s consternation—he’s partly redeemed his soul by loving God. The man who Len murdered. A Spirit who was an academic of some kind during life, and who believed in the truthfulness of Christian doctrine. A damned soul who in life was a Christian bishop. He wrote a series of intentionally provocative articles questioning the Christian doctrine of resurrection, and now refuses to change his warped beliefs. An enormous angel, whom the Narrator mistakes for a waterfall.The Water-Giant’s extended arms and awesome demeanor evoke the spirit of Jesus Christ. A vain, pretentious painter who refuses to go to Heaven because there would be no need for paintings there. The Artist exemplifies the pitfalls of creativity—it can be a link to the glory of God, but also a distraction from it. The husband of a female ghost—supposedly a lazy, negligent husband. A Spirit who vainly tries to convince a ghost to join her in Heaven. A Spirit, and the brother of Pam. Reginald vainly tries to convince Pam to join him in Heaven. The child of Pam, who died too soon. A ghost who refuses to join Reginald and Michael in Heaven because of her professed love for Michael, her child. A lovely, beautiful Spirit who knew Frank in life, and tries to convince him to join her in Heaven. Arn, Jackson. "The Great Divorce Characters." LitCharts. LitCharts LLC, 5 Dec 2016. Web. 19 Apr 2019. Arn, Jackson. 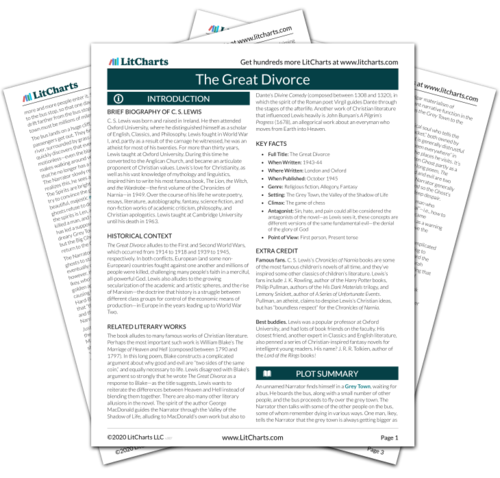 "The Great Divorce Characters." LitCharts LLC, December 5, 2016. 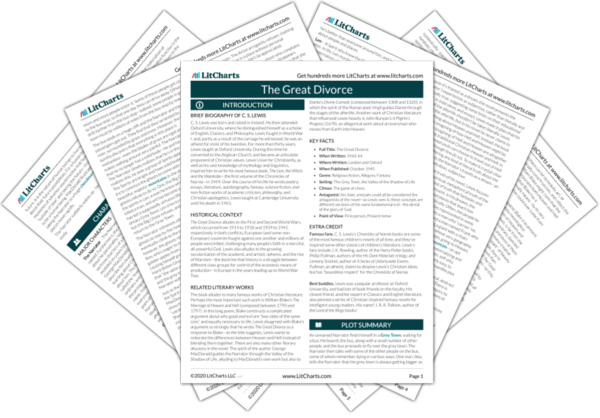 Retrieved April 19, 2019. https://www.litcharts.com/lit/the-great-divorce/characters.